CLEVELAND, Ga. — Meeting in a combined called meeting and work session Monday, the White County Board of Commissioners voted to deny a request by Tanvor, LLC to rezone 38.59 acres on Georgia Highways 255 and 384 from Agriculture Forestry District to Planned Development to accommodate construction of more than 30 single-family homes. The Planning Board recommended denial of the request based on its belief the proposed development did not meet Planned Development standards. Commissioners voted 4-1 to accept the recommendation with Commissioner Lyn Holcomb opposed. Commissioners also approved a preliminary list of 2020 Special Purpose Local Option Sales Tax (SPLOST) projects. Before the one-cent tax can be collected, however, voters will have the opportunity to vote on it in a referendum. The most expensive projects on the SPLOST list include a $5 million renovation and addition to the county courthouse and payment to the White County Development Authority to pay for Yonah Preserve Park. 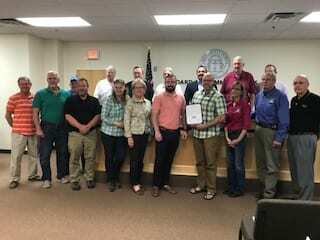 The White County Chamber of Commerce was presented with a proclamation declaring April 29 through May 5 as Small Business Week in the county. Commissioners tabled the approval of spring 2018 county SPLOST road projects and acceptance of Shepherd Drive into county road maintenance. ⦁ Award of a $170,000 certificate of deposit to South State Bank at a rate of 1.05 percent for one year.